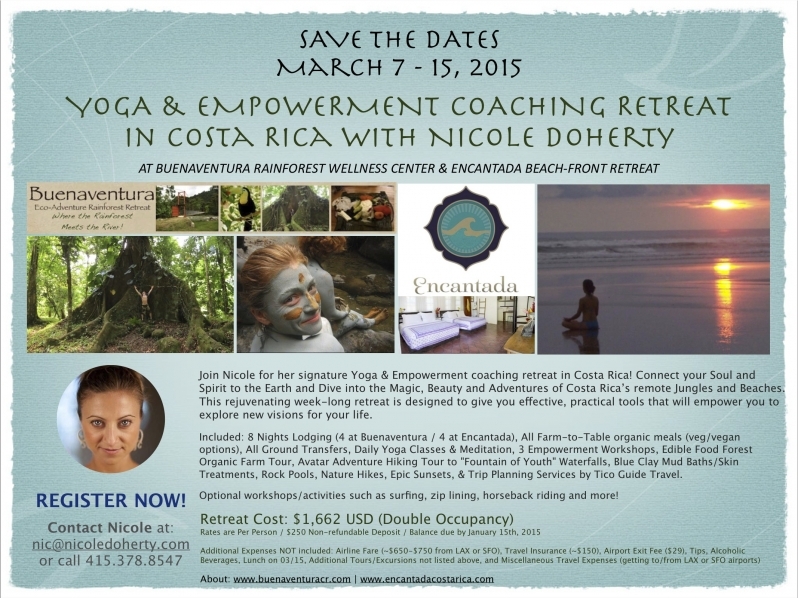 Experience Nicole’s powerful “Empower to Evolve” workshop series that was created for personal transformation. This rejuvenating and regenerating week-long retreat is designed to give you effective, practical tools that will empower you to explore new visions for your life. Enjoy daily yoga, pranayama, meditation, farm-to-table organic vegetarian/ vegan meals,“Fountain of Youth” waterfalls, blue clay skin treatments, rock pools, nature hikes and epic sunsets, and optional workshops and activities including “Cacao to Chocolate Making Workshop”, canopy ziplines, surfing, horseback riding and more! LIMITED SPACES AVAILABLE. INTIMATE GROUP SETTING. After we talk you can pay directly here through Paypal $250 non-refundable deposit per person. It was great Carlette, thank you and glad you enjoyed the pics! Hello from Alpine CA … Love the music on your web page. Thank you for the like!!! Hello Alpine!! !